Several weeks ago, Betty and I led some intrepid friends on a photo safari to the Camas Prairie area of Camas County, northeast of Boise. Typical late May weather brought wind and fog and rain and snow instead of sunny skies with puffy clouds sailing east to west. 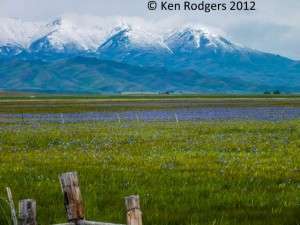 It was Memorial Day weekend so we anticipated a wild stampede of Idaho locals since it was the peak of the camas bloom. Camas is a member of the lily family and erupts in the spring from bulbs that like flat terrain that collects a lot of winter snow and moisture. 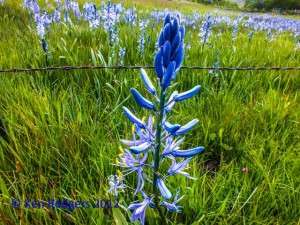 Before the arrival of Europeans, Native Americans cultivated camas to some degree, using sophisticated management practices to protect and even increase the production of this (at one time) important food source. In wet, good years, camas explodes on the prairies and from a distance looks like lakes and ponds when it peaks out in the bloom. To defeat the crowds, we left early. That’s how Betty and I defeat the crowds. Leave early. The weather may have been a problem if we had let it, but we’ve found over the years that if you get out there, even in inclement weather, you can find something to fall hopelessly hopeful over. We led our Sonoma County, California, friends, Shelley Macdonald and Rod Helvey, and our Boise friend, Linda Kahn on the trip. We made a new friend, too: The Idaho landscape painter, Geoff Krueger, who also came along. The wild weather chased the crowds away and we enjoyed the camas and the quiet along with the spitting rain, the fog, the wind as we stopped and shot photos, photos, photos. On the prairie, the camas indeed looked like lakes and ponds, the sky was a wild palette of grays and blues and whites. Everywhere the honks of geese, the skrakes of cranes, the quacks of ducks, the whistles in the snipe wings, the plaintive cries of willets and curlews and phalaropes. We shot prairie grass, camas, sheep shipping pens, reflections in the water that ran everywhere. 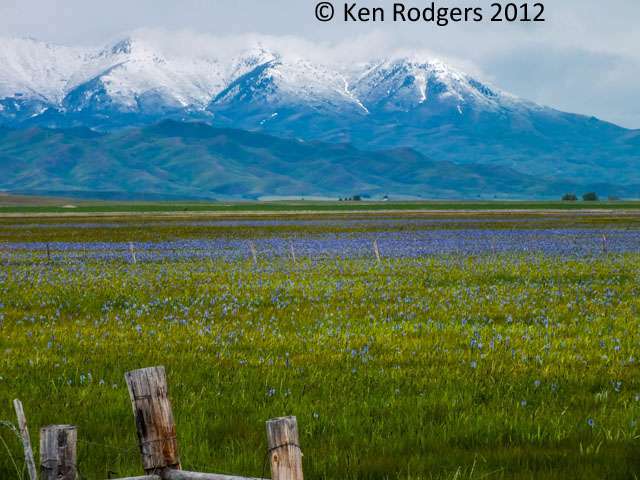 The snowcapped Soldier Mountains loomed off to the north, the latest dusting of snow like icing on a cake, and the snow’s form matched the shape of the sky as it glowered and mists of rain fell like paint flowing over a canvas. The farm architecture, barns, schools, churches, homes, tractors stood out on the stark horizons against the day’s gray gloom like something out of Grant Wood or a rural Edward Hopper. We shot camas and camas and did I say camas? Cattle and golden eagles and aspen and pine trees. 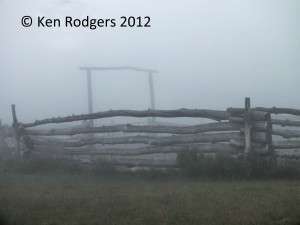 Geoff Krueger was along to see the country and take photos as inspiration for his paintings. He took a ton of photos. Betty and I found ourselves watching him. We sneaked looks as he framed his pictures. We could see the composition in the LED screen as he zoomed in and out, moved the camera about, got out of our CRV, walked around, got back in. I loved the emotion that roared up in me when I’d see what I thought was the perfect composition in his LED, but no, he’d adjust it and yes, it would be so much better. After lunch in Fairfield at the Iron Mountain Inn, we went back to the prairie and shot more camas. Then we wended our way back to Boise through the Bennett Hills and the edges of Bennett Mountain. 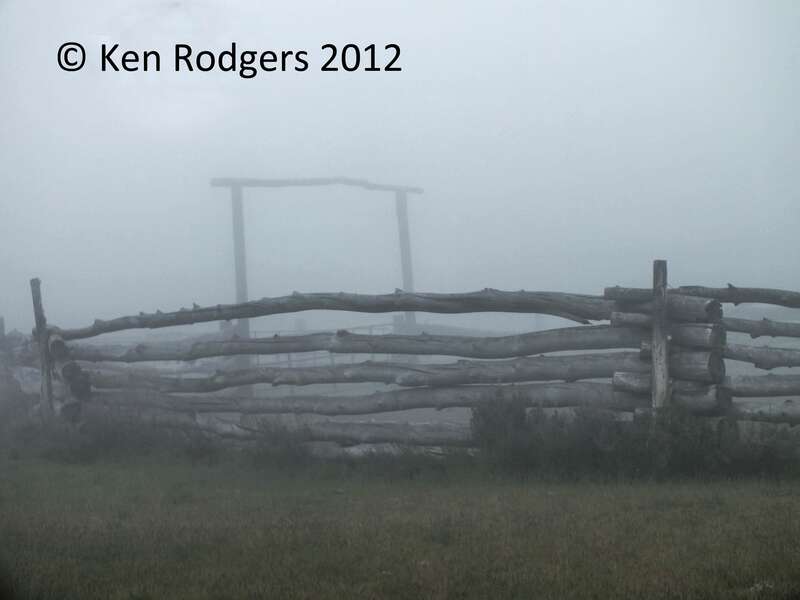 At the top, near Cat Creek Summit, we hit thick fog that dripped off the logs of an ancient corral and spits of snow that pinged us as we shot photos of aspen thickets. I don’t know how many photos Geoff Krueger snapped; it was at least two cameras full. Betty and I are excited to see when some of what we saw him composing in his LED screen shows up in a gallery somewhere. Salt Lake, Seattle or LA? Boise? Or perhaps his Daily Dose of Painting on his website. You can find out more about Geoff Krueger’s work here.